One of the most recognizable pieces of music in the Classical music repertoire is "Spring" by Antonio Vivaldi. Exposing our children to beautiful music is a gift we can give them so EASILY. When we play music in our home and teach our children about its finer points, we are developing an appreciation for beauty and goodness. There is so much to be learned from Vivaldi's "Spring" from The Four Seasons. I'll touch on the basics today. I will walk you through a SQUILT music appreciation lesson. SQUILT (Super Quiet UnInterrupted Listening Time) are lessons are designed to expose your children to the great musical classics. There is NO WORK required from you, the parent. I have done the legwork for you. Just follow along with the lesson and you will be fine! These lessons are designed for parents with little to no musical knowledge, but they also work well if you have a musical background, too. First, download and print the SQUILT notebooking page. Vivaldi was a Baroque Era composer, born in 1678. He lived in Italy, and was known as The Red Priest (because of his red hair). There are actually THREE parts to Vivaldi's Spring. They are organized by tempo (which means the speed of the beat). Tell your student(s) you will be listening to the first movement (section): Allegro. Remember - the first listening of the piece in SQUILT is done with eyes closed, listening for the elements on the notebooking sheet, using their imaginations to come up with a picture in their mind, and just enjoying the music in general. *I don't stifle children from moving during SQUILT! When I taught elementary music, this piece was one of the most popular we did - I had many conductors and violinists in my class as we listened. You WANT your children to internalize the music. 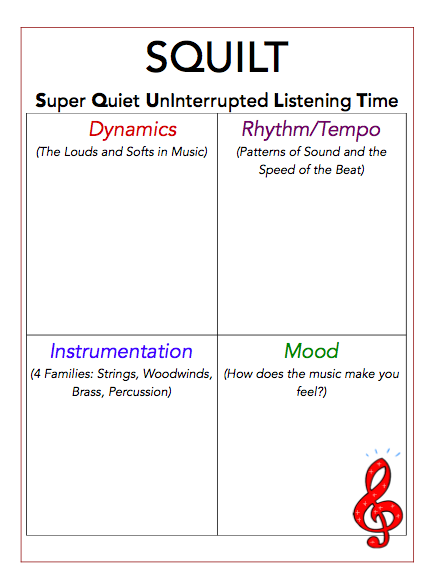 After the first listening, play the music again, and go over the notebooking sheet with your child. This should be pretty simple in this piece. It is mostly loud, but they will hear some places where it drops suddenly and becomes quiet, then growing louder again. Encourage them to express this. In this piece we emphasize the TEMPO - which means the speed of the beat. Allegro is the Italian word for fast and lively. There are also many recurring rhythms in this piece. This video is fun because it shows the exact rhythms of the music. Older children might appreciate this. The only instrument family that will be heard is the String Family. 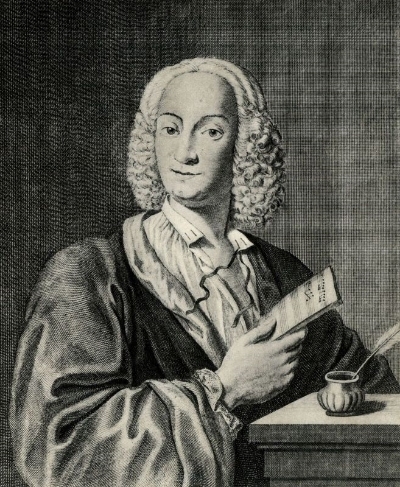 Vivaldi originally wrote the piece for the Baroque String Orchestra, but today it will be performed by various arrangements of modern strings. The mood for this piece is obviously joyful and hopeful - it mirrors how we all feel in spring, when everything is beginning to bloom and green up. For younger children, it might be fun to ask them to draw their favorite Spring flowers, or whatever pops into their sweet little minds while they are listening. Turn this lesson into a small study about Vivaldi. Research the composer. Listen to other music he wrote. Locate his birthplace on a map. What was going on during the time period in which he lived? To extend learning a bit, the following books and recordings are very nice. Vivaldi's Ring of Mystery - a CD by Classical Kids all about a young girl who finds herself as the student of Vivaldi - all of the Classical Kids recordings are top notch. Children of all ages are using them and asking for MORE. That's what it's all about - spreading a love and appreciation for beautiful music to our children.